A band of quartzite arches across the North Carolina Piedmont northwest of Winston-Salem, linking three of the Triad’s top climbing destinations. Two of the three are readily accessible in Hanging Rock and Pilot Mountain State Parks, but the third is more elusive. Sauratown, named for the Saura Indians who once inhabited the region, is privately owned within the boundaries of Camp Hanes, the YMCA of Northwest North Carolina’s 400-acre residence camp. Offering some of the best winter cragging in the Southeast, Sauratown was frequently visited by climbers for years, but a fire raised concerns about public access. The area was closed to the public until several years ago, when Carolina Climbers Coalition (CCC) started talking with the Y about ways they might work together. Talks have led to a strong partnership between the YMCA and CCC, opening up Sauratown for winter climbing. What started off as a limited window of three weekends a year has now expanded to a four-month climbing season running from December 1 to March 31. The bottom line—you can now access Sauratown during its prime winter climbing season. 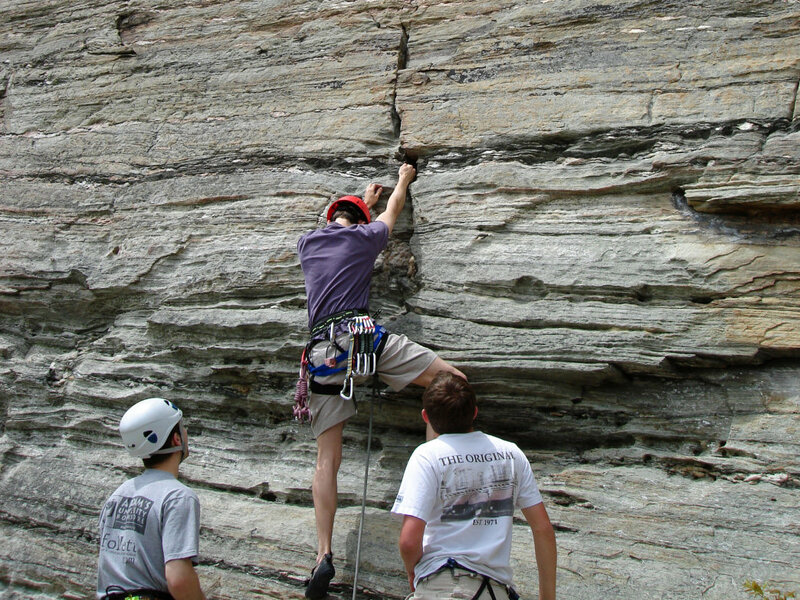 Established more than 20 years ago to preserve natural areas, promote safe climbing practices, and protect access, the CCC is a nonprofit organization that represents climbers across the Carolinas by working with federal and state agencies to open up climbing in national forests and state parks. The CCC owns and manages four properties, including the largest cliff on the East Coast, Laurel Knob, which is located near Cashiers; six acres of the Rumbling Bald West Side Boulders near Lake Lure; Hidden Valley, a sport climbing destination near Abingdon, Va.; and Buckeye Knob and the Barn Boulders, an historic area near Boone that was threatened by logging interests. In addition to the lease at Sauratown, the Coalition has a lease agreement to open access to the Asheboro Boulders for the Coalition’s 500 paying members. 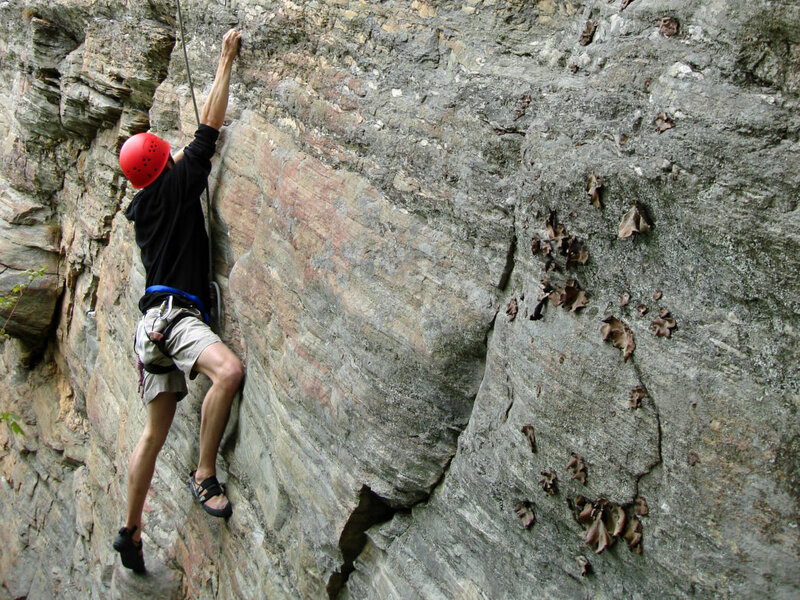 Shared access to Sauratown is a win-win for the Y and the climbing community. The cliff’s southwestern exposure makes for warm and sunny conditions in winter, and fits around the camp’s summer operating schedule. The CCC maintains the 20-year, $5,000-per-year lease and, with start-up funding from the American Alpine Club and several grants from REI, is in the midst of making improvements to the 1-mile approach to reduce the incline and create a sustainable trail. The hike takes about 30 minutes and leads you to the base of the cliff at Monkey Buttress. If you’re determined to hit the mountain early, free tent and platform tent camping is available on weekends through Camp Hanes. An advance reservation is required. When the area first reopened, the limited weekend-only access made for crowded conditions, but the four-month climbing season has eliminated congestion issues. On a typical weekend, you may share the cliff with 30 to 40 other climbers. Sauratown fills the gap between Hanging Rock and Pilot Mountain, literally and figuratively. The cliff is geographically situated between the two state parks. 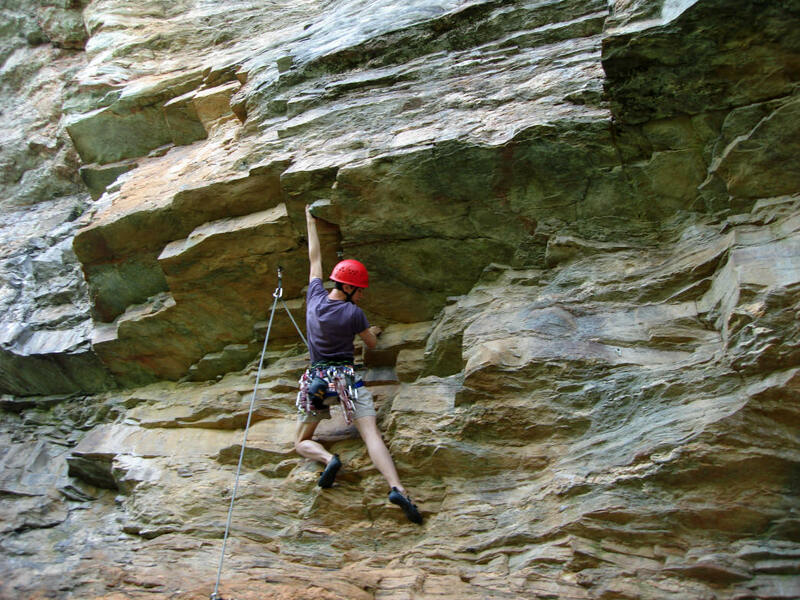 While Pilot Mountain offers sport and top-rope climbing, Hanging Rock is primarily a trad destination. Sauratown sits in a sweet spot between the two with sport routes for the less experienced, challenging trad climbs for intermediate to advanced climbers, and bouldering as well. Sauratown offers up several moderate routes like 5.6 Whiskey Sour, the best trad line on the cliff, but is ideal for the intermediate to advanced intermediate climber. The CCC’s detailed online guide gives you everything you need to know about routes and gear requirements. On windy days, Party Ledge is a great choice, as it’s located on the most sheltered part of the cliff. Sitting beneath a substantial roof, the ledge is home to a cluster of excellent sport routes ranging from 5.8 to 5.10b, including Big Erector, Kish Dish, and Lust in a Cheap Motel. It can get crowded when the temperatures drop, and most sport lines are not closely bolted, so be prepared for long runouts and high first clips. For more experienced climbers, 5.10+ Orange Dihedral and 5.11a Sour Balls are excellent trad routes on the highest part of the cliff. You’ll find two outstanding mixed routes, 5.10+ Stokes County Monkey Trail and 5.10c Shock the Monkey, on Monkey Buttress. Classics include the spectacular exposure of 5.10b DC Comics, the crimpy start and steep, pumpy finish to 5.11b Skin Toy, and The Fugitive, a 5.13a that’s the hardest line at Sauratown. Logistics and climber etiquette are especially important at Sauratown to maintain the lease agreement and partnership with the YMCA. "Basically, just be a nice person," says Payst. Access starts at 8 a.m., even for campers, and is strictly limited to December through March. Pets have to stay at home, including dogs, and property managers appreciate it if you keep noise to a minimum. You’ll want to fill out a waiver at the kiosk near the camping platforms before you climb, and carpooling is encouraged. Stick to the parking area, trail, and cliff and be respectful of the camp’s private property. More tips are listed on the CCC website.